From Ross Perot’s 1992 claim that the North American Free Trade Agreement would generate a “great sucking sound” as jobs moved from the U.S. to Mexico to President Donald Trump’s claim that the agreement is a job killer, it has been good politics to blame trade with Mexico (and more recently with China) on job losses, particularly in the manufacturing sector. This might look like a fulfilled prophecy given that the increasing trade deficit of the U.S. between 2000-2010 coincided with the loss of close to 6 million manufacturing jobs (yet, since 2010 the manufacturing sector has added over 800,000 new jobs). But the truth is that all advanced economies have been steadily reducing the share of employment in manufacturing, regardless of trade deficits or surpluses. Rather than trade, increases in productivity and technology have been a much larger driver of manufacturing job losses. Compared to the early 1990s, it takes about half the number of workers today in the U.S. to produce the same output. In fact, from 2000 to 2010, while jobs were being lost, total manufacturing output increased by over $800 billion. So how much of the job losses from trade can be attributed to NAFTA, and in particular to Mexico? While it is difficult to assess, it is estimated that U.S. trade with Mexico led to little over 100,000 manufacturing net job losses—equivalent to about 0.1 percent of the U.S. labor force. In fact, good trade agreements should produce job losses in some sectors due to increased competition and the restructuring that follows. Yet, as Harvard’s Dani Rodrik points out, even if NAFTA increased overall welfare for Americans, it has caused labor market challenges such as relatively slow growth of wages of blue-collar workers in areas more exposed to imports from Canada and Mexico. Instead of bemoaning such job losses, the administration should instead focus on better assisting people who lose their jobs—whether due to trade, technology, or productivity gains – to find new work. This could include improved education and training, wage insurance to encourage workers to renter the workforce early, and allowances to encourage people to move to where the jobs are. What about the U.S. Trade Deficit? President Trump also sees the U.S. trade deficit, particularly with Mexico and China, as evidence that the U.S. has been losing from trade. Trade among countries is not a zero-sum game, where some countries win and others lose. A country’s international trade position is the sum of the millions of decisions by consumers and firms to purchase and sell goods and services. To assume a loss from trade it is necessary to assume that overall everyone has been made worse off by their decisions all of the time. In the case of NAFTA, American consumers are better off from having a greater variety of goods at lower prices. Imports also give businesses access to lower cost inputs, which in turn increases their competitiveness in domestic and overseas markets. The ability for the U.S. to export opens new markets for its businesses and generate more jobs. The U.S. trade deficit does not reflect the U.S. “losing out” in international trade. In fact, steady economic and employment growth since the 2009 Great Recession have coincided with a 30 percent increase in the U.S. trade deficit. From an accounting perspective, the trade deficit (plus other international cash flows) reflects a lack of domestic savings to finance investment. This gap is covered capital inflows from foreign countries investing in the U.S. Thus, raising tariffs on imports will not eliminate the deficit, as long as the investment and savings gap remains. The U.S. trade deficit with Mexico is not the right measure to assess the benefits of NAFTA. It instead reflects the underlying structure of the U.S. and Mexican economies. Mexico has become part of North American supply chains, which gives U.S. businesses access to lower-cost inputs. 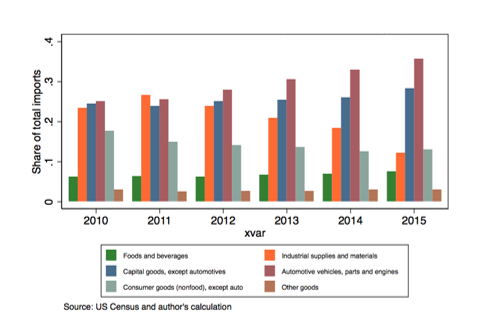 In fact, over half of U.S. imports from Mexico are intermediate goods, as shown in Figure 1 (intermediate goods are categorized as “capital goods” and “industrial supplies”). The integration of North American supply chains also suggests that the U.S.-Mexico trade deficit is overstated. Imports from Mexico often include U.S. value added as U.S. exports to Mexico are in effect embodied in subsequent Mexican exports to the U.S. According to the Organization for Economic Cooperation and Development, over 45 percent of Mexican exports comprise foreign value added. It is not clear how Trump would renegotiate NAFTA. His view that protection makes the U.S. stronger, combined with a political imperative to bring back manufacturing jobs, may lead the administration toward reducing flows of goods and services among the U.S., Canada, and Mexico. Such an approach would reduce the competitiveness of U.S. manufacturing and impoverish North America. The Trans Pacific-Partnership (TPP), which Trump withdrew the U.S. from in his first day in office and included Mexico and Canada, was also a modernization and improvement of NAFTA. New rules on digital trade and commitments to address unfair competitive practices would create opportunities for a growing U.S. export sector. The best way forward for Trump would be to build on what Canada, Mexico, and the U.S. agreed upon in the TPP. The U.S. could also seek to tighten automobile rules of origin as a means of forcing greater manufacturing within the NAFTA countries. But such a move also risks reducing competitiveness as companies could be forced to source from more costly suppliers. Updating labor and environmental rules in NAFTA could prevent countries from lowering standards to induce trade and investment. Making such commitments subject to dispute settlement would also strengthen compliance. Trump could also tie NAFTA renegotiation into his infrastructure plans, improving road, rail, and internet connection between Mexico and Canada, further building a more integrated and economically significant economic area. What’s certain, reducing opportunities for international trade will make the U.S. poorer. And renegotiating NAFTA with the aim of reducing the trade deficit or bringing back manufacturing jobs to the U.S. will achieve neither. The key challenge for this administration should instead be how to better assist workers adjust in a dynamic economy.